It’s not every Friday night that the spectacle of arguably the world’s biggest music recording star pops into town, with his equally famous spouse and nautically named daughter. We had to wait for it too – after dropping the West Coast leg of the BDO in 2012, this was Kanye’s first show in Perth since his Good Vibrations appearance in 2008 which left many unimpressed, and his original dates this year got postponed. Opening up early was Pusha T, half of formidable hip hop duo Clipse, a rising star in his own right and a key member of Kanye’s GOOD Music label. It was a pity Mr T’s set wasn’t a bit later as he would have had a chance to impress a lot more people. The build up to his entrance was dramatic, with the orchestral tones of The Imperial March from Star Wars booming out of the speakers. All of a sudden it went dark, and there was a deafening howl of angry dogs barking and growling – referencing the video clip for Black Skinhead. Then there was an explosion and West emerged from the stage, rising from a hidden platform, in a plume of smoke and red light – which kind of seemed like the reverse of that scene from Star Wars, when Han Solo is lowered into the carbonite. Wearing one of his custom bejewelled masks he launched himself into Black Skinhead, with its industrial drums and riffage, and from that moment on he had the crowd transfixed. The monolithic rectangular LED screen at the back of stage exploded into life, and provided an amazing visual backdrop – flashing colours and patterns, and projecting solarised silhouettes of Kanye. Early on he busted out the heavy, trappy Mercy and the Foreigner-sampling Cold, two cuts from the Cruel Summer compilation that also featured Clique, which made an appearance later on. The show was tight, with tracks flowing together seamlessly. 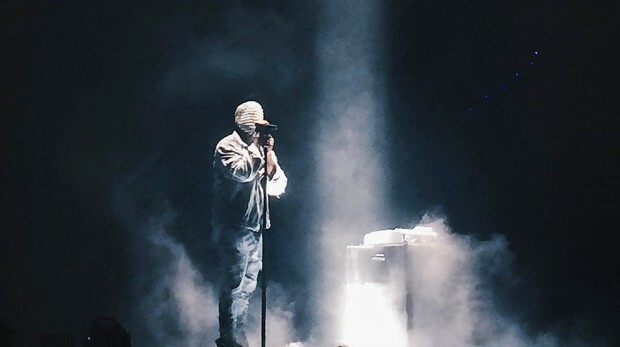 Some people might have expected a band or dancers – but apart from producer Mike Dean hidden up the back in the darkness, adding live guitar and keyboard, it was essentially the Kanye show. And put on a show he did. He tore through his formidable back catalogue, commanding attention and radiating energy, the atmosphere was electric. His vocal ability live has definitely improved and the Arena sound system delivered a loud and clear mix. Can’t Tell Me Nothing was delivered with gusto and had everyone singing along. The auto-tune soaked Heartless had to be abandoned due to tech problems with the auto-tune, but he quickly redeemed himself with a blinding rendition of old school favourite Jesus Walks. He shouted for the crowd to “Make a circle!” as he launched into Blood On The Leaves. The Daft Punk-sampling Stronger proved it is still an epic track – and served as an end of the first set as West left the stage. Soon enough he popped up again out of the floor, illuminated in bright, white light and armed with an MPC, with which he launched into Runaway. His penchant for ridiculous statements came to the fore though when he commented, “Now, there’s only two times in history – before Yeezus and after. One day I want you to tell your kids about tonight.” When you see a Kanye show, you get to see him in his element, and somehow it all kinda makes more sense. He returned after a suspenseful break, to perform an intense reprise of Blood On The Leaves, the trap edged, Nina Simone-sampling track was probably the highlight of Yeezus, so it was fitting to end, as the giant red LED tower appeared to slowly sink into the stage. There’s no one quite like Kanye and what he does next is anyone’s guess – but it’s bound 2 be exciting to witness. West is a man unhampered by expectations or trends, blazing his own trail and following his creative muse wherever she may take him – and that’s really what you want artists to do. What a rubbish biased review. Not worthy of being printed. You could not possibly read a future review by this guy without an abligatory pinch of salt. Get some experience and an education on live music before your next review please champ. Tony Williams was there. He was standing just right of Mike Dean and his decks.